Cotin Doll World is holding a Doll Photo Contest. The photos accepted will be of dolls wearing a Cotin Doll wig. Join us for the fun and excitement of the COVER DOLL Photo Contest. Cotin Doll World is hosting a photo contest event. All entries will be displayed on the Cotin Doll World Website. Cotin Doll World’s staff screens entries based on photo quality, composition, and creativity of image and selects the top 10 for public voting. The photo receiving the most votes will receive the prizes and will be presented on the home page in Cotin Doll World’s website and Cotin Doll World items. Complete rules are located on the company’s website HERE (Select the language button preferred to view). Entry Submissions- now until August 7, Voting Period – August 14~ August 21, Result Announcement- September 4~ september 11. Prizes include: GRAND PRIZE Grand prize winner will be featured on Cotin Doll World¡¦s home page from 9/4-9/11. Winner will also receive a $300 Cotin Doll World online shopping credit. 2nd PRIZE $150 Cotin Doll World online shopping credit. 3rd PRIZE $75 Cotin Doll World online shopping credit. Short article and video of the latest work of Marbled Halls including some of her most recent work. Check it out HERE. In addition, the company posted a notice that their office would be closed from 31st July to 5th August for vacation. They will resume all work August 6. All orders placed during the vacation period will be addressed on their return in the order in which they were received. Denver Doll Emporium is carrying an exclusive version of Elfdoll’s Vivian. Hyacinth is available in a Limited Edition of only 20 dolls. Vivian has a realskin Rainy girl body, both straight and fist hands, eyes, and shiny soft special face-up. To see the rest of Today’s News, please go HERE. Pipos has released the basic versions of their PO-11 boy and girl doll and also a basic version of the Cheese Mouse. The boy and girl are called Ron and Mari in the basic version. Either head can be ordered with a choice of boy body, or girl body (smaller or larger bust). The dolls come with straight hands, but optional curled hands are additionally available. Ron and Mari are cast in normal skin resin and come with acrylic eyes. The Cheese Mouse, a Junior PI, is cast in beige resin and comes with a random pair of acrylic eyes and optional face-up. His resin swiss cheese is also optionally available. The next doll in Domuya’s Life Project has been revealed, Aria the Tide Guardian. A donation to the World Wildlife Fund will be made with the purchase of each doll. Due to a slight delay in releasing Aria, the Drui can still be ordered until the 17th (China Time) from Domuya or from Domuya’s authorized dealers; in the USA Region – The Doll Peddlar and Lone Star Dolls, and in Europe, Netherlands – Think Pink. BJDcollectasy will be adding new photos of Aria to the Domuya Life Project Gallery Album in the near future. To see the rest of Today’s News, go HERE. Dolkot is now offering “premium order albino skin” for any 60 SDK Star doll. The cost is a little higher than real skin. The color is described as “very bright pink and clear skin.” The ordering menu allows customers to select any head in the SDK Star line and choose either a male or female body. Face-up is optional. Article about popular retailer Jpop dolls and the OOAK ShinyDolls they have been offering that are painted by talented artists in the BJDworld. 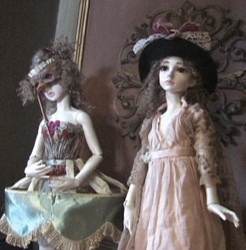 The gallery of dolls can be seen HERE. To read the rest of the BJD news, go HERE.